Cameron Highlands offers a breathtaking view of the natural scenery in the area. Tourists can pick strawberries, roam around teal plantations and honeybee farms or go inside an authentic English cottage. You can breathe in the fresh highland air on the hill station or opt to take a walk around the cool and serene environment. Visitors will also find beautiful vegetable gardens, butterfly farms, a rose garden and small strawberry farms here. The place is popular for its plantations and jungle walks. 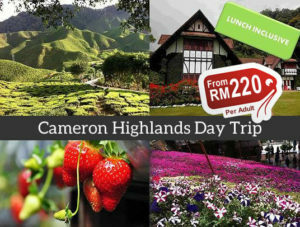 Cameron Highlands which is a short trip away from Kuala Lumpur offers one of the best nature scenery in Malaysia. The plantation fields and hills can be clearly seen from atop the farm making it the perfect place to relax. The cool climate is one of the biggest reason why people want to visit the place. They come in groups with their cool weather gear to enjoy the 10oC to 25oC climate of the plantation. It is also the perfect place for growing crops. Tea was first planted in the area back in 1929 four years after the site was first developed. BOH (Best of Highland) tea and Cameron Valley brand are the most famous tea brands that come out of the area. Fresh fruits, flowers, and vegetables are also produced in the plantation since it has an ideal environment provided by sitting 1524 meters above sea level. Visitors love to explore the more than 443 square kilometer area. Tour packages can cover many of the 14 stops inside the highlands. Scheduling a full day trip inside Cameron Highlands will really give you a complete experience with nature. Our tours to Cameron Highlands starts as early as 5 am on weekends and holidays and our weekday tours start at 7 am. This is to ensure that you get the full experience especially since nature spots like Cameron Highlands is best visited when the sun is coming up. This tour will have its own driver and guide to take you and your group around the different plantations. It comes with a lunch and snack package since you’ll be touring the place all day. There is also a time where you get to pick strawberries from their farm. The tour has limited number of seats which means you must book early to get your slots on your preferred time for the tour. 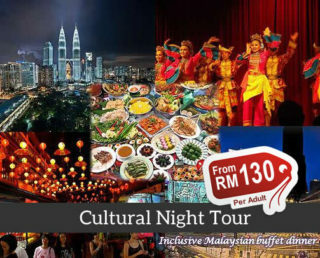 There are rates for different sized groups (2-3, 4-5, 6-7, and >=8) with the biggest group, group of 8 and above, having the most affordable rate at RM220 per person. 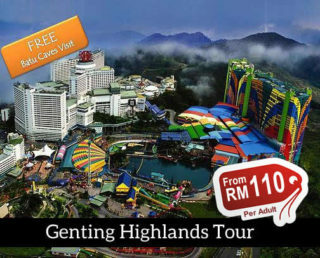 Kids aged 3-11 years old have a discounted price of RM200 when they join the tour. A visit to the tea farm is set where people can see the whole operations of the farm. They will get to see a documentary about the tea farm and the varieties grown here. You can also see the tea processing area to learn more about the production and maybe even buy their tea products before you leave. The rose garden contains that different varieties of rose they grow inside the farm. There are additional door charges, but it would be really nice especially if you’re a flower enthusiast or you want to give a rose to your loved one. This is the place where you can pick strawberries to keep as a souvenir of your visit to the area. You pick the strawberries and you’re going to weigh them for pricing. These healthy strawberries are very tasty to help you. Aside from the tea you can drink inside the BOH Tea Plantation, you are also treated with a great view since it’s located at higher elevation. There is a hiking trail to the plantation for people to use whenever they want to do some light exercise. There are various species of butterflies inside the park. Enjoy their company as they rest on your hands and shoulders. You can also see other plant and animal species as well. The Lata Iskandar water falls is a natural water formation inside Cameron Highlands. Visitors can see its beauty as a part of the tour. People can get their pictures taken and bring it home for memories once the tour is done. The Bharat Tea Farm is the next tea plantation developed inside Cameron Highlands. The products from this farm is called the Cameron Valley brand. Tourists love taking pictures here because the lush hills serve as a nice backdrop. Our tour passes through the BOH Tea Factory where we take our clients through tea processing. Tourists can also have tea beaks as a refresher before proceeding to the next part of the tour. This is a favorite stop among visitors because they get to see a blow pipes demonstration from the aborigines living in the area. They get to experience their culture as well making it a wonderful experience. Freshly-grown vegetables like carrots, chilis, cabbage, broccoli, green beans, tomatoes, brinjal, and cauliflowers are sold in this area. There you can see the daily operations at the farm level for the produce from Cameron Highlands. Inside the vegetable market, you get to see the fresh produce grown from the Cameron Highlands farms. This visit allows you to purchase vegetables to bring home. Also, a part of the itinerary, the honey bee farm is full of bee hives that produce different kinds of products. The most popularly bought products are the honey bee soap and virgin honey fresh from the honey-producing hives. Different cactus varieties can be seen on this stop. They get see large and small varieties of cactus grown here because the highlands provide an excellent environment for them to grow. Our tour to Cameron Highlands from Kuala Lumpur offers some of the best rates in town with a full list of stops for photos and visits in the area. You can secure lower rates when you book in advance for the tour. We will also get you the best tour guide as well. You will get a flexible scheme in terms of payment and pick-up point, so you can get the most convenient option for you. Just bring your camera and some cash for purchases during the tour and we’ll handle everything for you. No worries! Book our tour today! Traveled solo. 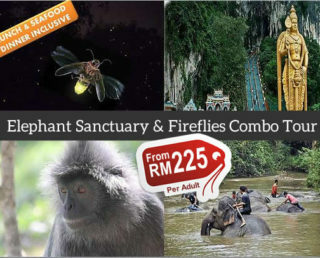 Been to Malaysia for three to 4 times already, but it’s my first to book a tour package. Since I was traveling on a limited time, I need to choose one package only and I did not regret that I chose this. The farms are amazing and so productive. I also got friendly discount from mytravellane for traveling alone. Amazing nature! Remind your travel Lane driver to drop you off in Strawberry farm so you can pick your own strawberries. Our car has a wifi inside! We did not expect it. My friends and I will make sure to check out your other tours, soon. I took home a lot of strawberries when I got to Cameron Highlands. My family enjoyed the fresh strawberries when I got home as well. As a tea enthusiast, the tea I had in their tea farm really tasted good. The highlands really made that tea taste great. It was even nice that I got to learn how to make tea for myself as well. Maybe I’d grow some at home. Great experience! You can find Tea, honey, handmade baskets, and beautiful gardens of all sorts of plants. Our group truly enjoyed that tour. Brought home a ton of natural and organic produce from Cameron Highlands. I would love to have a regular supply of their products all-year round! Thanks for taking me there MyTravellane. The tour was fun, tho we felt dizzy on the way to cameron highlands and way back since the way got lots of turns. The driver Sara is friendly and funny we had a great time. The lunch was also perfect. Thanks. The Cameron Highlands are really pretty. The rolling hills with tea are definitely worth seeing. The waterfall stop was also nice to get a picture. Nice tour guide and good arrangement. We are lucky that the weather was nice and no traffic congestion throughout the whole journey. The tour was fun, tho we felt dizzy on the way to cameron highlands and way back since the way got lots of turns. The lunch was also perfect. Thanks. Although it is a long journey away, the tour guide is very friendly. When you look down at the tea plantation, you will feel that you are not white. It’s a Superb and astonishing place, must go when you are in Malaysia. The Tea Gardens is just Awesome place. The tour was fun, tho we felt dizzy on the way to cameron highlands and way back since the way got lots of turns. It’s a Superb and astonishing place, must go when you are in Malaysia. The tour was great, highly recommended.The spacious and comfortable vehicle arrived on time, and the driver/guide was very efficient and friendly. Thanks a lot got the beautiful day. The Tea Gardens is just Awesome place. decent view, friendly guide and driver! the guide was a non-smoker too! The Tea Gardens is just Awesome place.The lunch was also perfect. Thanks. It’s a Superb and astonishing place,The Tea Gardens is just Awesome place. we enjoyed our trip to Cameron Highland. Thumb up !!! slightly expensive but worth a try! decent view, friendly guide and driver! Nice view and scenery. We really like the weather. It was an okay trip. . The weather is great. Also, the Tea Garden is worth going to. The tour was fun, tho we felt dizzy on the way to cameron highlands and way back since the way got lots of turns.The lunch was also perfect. Thanks. The time is not enough to experience the beauty of this tour ! Majestic indeed! Great place to enjoy with family. Lots of attractions, 1 day tour is not enough.